Chalkboard Paint. Can’t decide between a classic scary face or your favorite sports team’s logo for your pumpkin this year? That’s okay – you can have it all with chalkboard paint. Just cover your pumpkin with a couple coats of chalkboard paint, let them fully dry and then go crazy with chalk! Channel your inner Picasso, sketch a smiley face or simply write “Happy Halloween!” on the pumpkin. For a DIY chalkboard paint recipe, check out Off the Wall: Crazy Chalkboard Paint Ideas. Thumb Tacks. For a seriously bad-motha-pumpkin, buy a pack of brass or silver thumb tacks and go at it. All you have to do is push them into your pumpkin in whatever pattern you’d like to see. The pumpkin skin is soft, so the thumb tacks will go right in without any trouble. It’s that easy to be a little edgy. This entire project will take you five minutes and cost less than five dollars. How’s that for a low budget, high impact Halloween? Glitter. So maybe it isn’t scary, but Halloween doesn’t have to be all ghouls and no glitter. 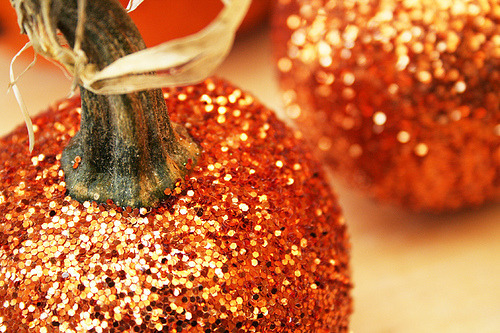 Bring a little dark charm into your house with glitter pumpkins. All you need is a bottle of glitter, Mod Podge, a foam brush, newspaper and finishing spray. We recommend you tackle this project outside unless you want your house to be coated in sparkles! For step-by-step glitter instructions, read Let’s Get Weird: Make Glitter Skulls. The steps are the same – you’re just using a pumpkin instead of a skull! Lace. For a Victorian-era take on the classic Halloween stoop decoration, cover your pumpkin in lace. You’ll need enough lace to cover your pumpkin, Mod Podge and a hot glue gun. First, measure your lace and cut it to fit the pumpkin - you want it to wrap around the entire pumpkin and be taut. Then, Mod Podge your pumpkin and immediately place the lace on the wet Mod Podge. You’ll feel like you’re wrapping a present. Cut any loose pieces and hot glue the edges so they don’t fray. Voila. Lacy pumpkin.